How Many People Play Chess? ‘Looked upon with great favor, the top Soviet players are rewarded with fringe benefits such as superior living accommodations and are subsidized with a state-paid salary. Is it any wonder, then, that today in Russia there are 625 registered chessplayers per 100,000 population as compared to two serious players per 100,000 population in the United States? In all, some 14,000,000 persons are chess devotees in Russia, and less than 4,000,000 in America. As mentioned in C.N. 9537, Stevens’ book was published in 1969. ‘For the truth is that Chinese chess players have not been dozing – but simply playing a different game. In fact, it is estimated that almost a quarter of China’s 900 million or so inhabitants are keen chess players – as have been generations of Chinese since the time of Confucius 2,500 years ago. Many other claims about the number of chessplayers, whether worldwide or in particular countries, could easily be cited, all lacking any indication as to where the figures originated. Already above, we have seen ‘it has been estimated that ...’, ‘it is estimated that...’ and ‘there are now estimated to be ...’, as well as ‘according to recent polls’. Other airy options include ‘It has been shown by studies that ...’, and these impersonal and passive constructions help circumvent the need to identify the estimators, pollsters and studiers. The published interview does not record that Mr Redman sought substantiation of the statistics, or an explanation of what ‘play chess’ means. Any future C.N. items on this topic will continue to focus on claims recorded in books and magazines, and not least claims from former times. 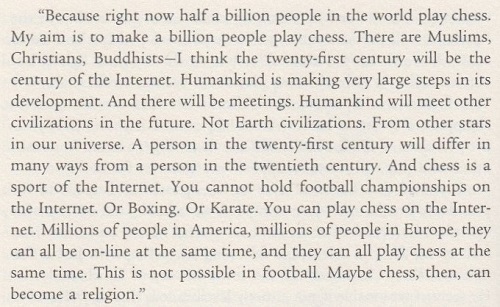 When, for instance, was an estimate of the number of chessplayers worldwide first put forward? On 1 May 2016 Justin Horton posted an article, Think of a number, with a link to a video presentation in which ‘600 million’ tripped off Daniel Roberts’ tongue and, concerning the United States, ‘about 30 million’ tripped off Maurice Ashley’s. On page 34 of the same issue an editorial note referred to ‘C.S. Howell’s eloquent arraignment, which, by the way, seems to err by underestimate, as we believe that there are at least ten thousand chessplayers in the United States’. There was no indication as to how either estimate had been made. The wording was slightly different on page 336 of the more readily available 1932 and 1947 editions, but the figures were the same. Latest update: 31 January 2019.